A child development expert at Bangor University is involved in the international launch of project materials which will assist governments around the globe to support healthy and successful child development. www.livestream.com/idbevents2 in Spanish) will promote the project materials. Dr Helen Henningham’s field of research is early childhood interventions to promote young children’s development and behaviour in low and middle-income countries. 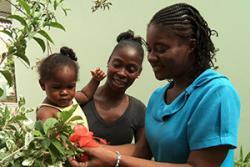 She has had a long involvement with a successful curriculum in Jamaica, which is being replicated internationally. The package is based on the Jamaican Early Childhood Home Visiting Curriculum developed by the Child Development Group in the Tropical Medicine Research Institute at the University of the West Indies (where Dr Henningham worked for a long time). Organisations or governments will now be able to access the materials which will enable them to deliver an early childhood home visiting programme for children aged 6-36 months in their own country. The materials will be implemented in Brazil, Guatemala and Zimbabwe during the next year as part of a current grant from Grand Challenges Canada. According to the IDB, “Reach Up and Learn,” the early childhood development program has had a significant impact on education and workplace outcomes over the 20 years since its implementation in Jamaica. Extensive evidence from the programme has shown that children who participated in the program 20 years ago had higher IQ, did better in school, had better mental health, were less involved in crime and had higher wages than non-participants..
A member of the REACH-UP team (now with a Bangor University’s School of Psychology), Dr Henningham is currently working on two large scale effectiveness trials of early stimulation interventions (one in Colombia and one in Bangladesh) which involve integrating parenting programmes for children under three years into existing government initiatives.